The purpose of the LSUHSC-S strategic plan is to provide an integrative framework for our institution. It provides direction for planning and action by our Schools and Hospital in satisfying the mission of the Health Sciences Center-Shreveport. It also assures an appropriate framework for accountability that is fundamental for continuous improvement within all our constituent programs. In addition to this electronic format, the printed form of the current catalog is available from the Office of the Registrar at LSU Health Sciences Center at Shreveport, located in Room 1-212 on the first floor of the Medical School. Louisiana State University Health Sciences Center at Shreveport is committed to providing a safe and healthy work environment in which hazards are eliminated or minimized for patients, visitors, and employees and by which work-related injuries/illnesses are minimized through a program of hazard reduction, elimination, engineering controls, personal protective equipment, education, and work-site surveillance. 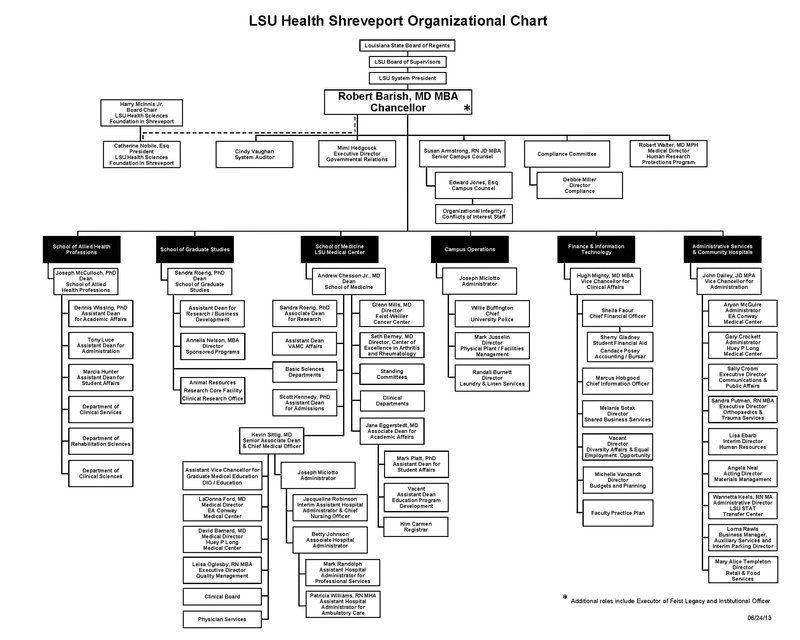 In order for Louisiana State University Health Sciences Center at Shreveport to succeed in reducing accidents, hazards, and risk exposure, each employee is instructed to devote daily attention to making his activities and/or operations as safe and accident free as possible by complying with the LSUHSC-S Safety Program. The Office of Environmental Health and Safety is committed to administering this safety program for LSUHSC-S. It is located in Room O-300, 3rd floor of the Out-Patient Clinic Building, 1501 Kings Highway. Development and testing of campus emergency operations. Auxiliary Enterprises has the responsibility of assessing the needs of the institution’s population and providing those services and products desired at a competitive cost. By legislative mandate, each Auxiliary unit must receive adequate revenues to cover all costs, because Auxiliary units receive no state appropriations. Auxiliary Enterprises’ goal is to maximize convenience and cost savings to the academic, administrative, research, and clinical departments as well as the faculty, staff, and students of LSU Health Sciences Center at Shreveport. The library is an academic department in the School of Medicine and serves as the principal information resource for the Schools of Medicine, Graduate Studies, and Allied Health Professions, as well as the LSU Hospital. The library currently occupies over 39,000 square feet on three floors with seating for 239 users at tables, at carrels, and in study rooms, as shown on the library map. The library’s holdings can be searched through the online catalog. The library’s collection includes over 170,000 print volumes (books and bound journal volumes). Access is provided to over 4300 electronic journals, 152 databases, and more than 1100 electronic books. The library is open 102.5 hours per week (library hours & holiday schedule). Off-campus access to electronic resources is available for LSU Health Shreveport faculty, staff, and students 24 hours a day, 7 days a week. The library has two computer labs. One computer lab has 29 Windows XP workstations and a projection system for teaching. The second computer-teaching lab has 20 workstations, also equipped with Windows XP, and a projection system. Network connectivity for laptop computers and mobile devices is provided through a wireless system available on all three floors. Photocopiers, printers, and flatbed scanners are available to the public in the library. Seven public search stations throughout the library offer access to databases and other electronic resources. For access to materials not in the library’s collection, faculty members may place interlibrary loan requests electronically using the ILLiad system. Desktop delivery is available for most interlibrary loan requests. Charges for interlibrary loan are incurred if the lending library invoices the LSU Health Shreveport library. However, the library has reciprocal borrowing agreements with many local, regional, and state libraries. A writing consultation service is offered by the library free of charge to faculty, staff, and students who would like assistance with editing and proofreading documents. The library also has a departmental liaison service. The liaison’s role is to foster two-way communication between the library and an academic department or program. The liaison establishes a relationship with the faculty in an academic unit and becomes familiar with its subject discipline and resources. He works with the faculty to ensure that relevant information access skills and tools are incorporated into all levels of the program to which he is assigned. For information about the library’s policies on issues or services such as computer and Internet use, copyright, and reference services, visit the Library Policies page. In summary, the LSUHSC Medical Library in Shreveport provides LSUHSC-Shreveport students, faculty, and staff with ready access to critically important information required for research, patient care, and teaching.